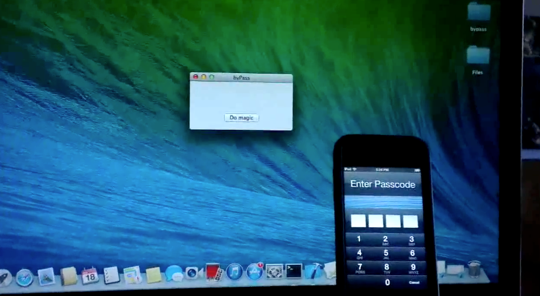 A new application is being developed by Freemanrepo called byPass that removes the passcode from your iPhone, iPod Touch or iPad. The application is going to function similar to other apps like StifleStand in the way that you will simply be required to press a simple button “Do Magic” and your device will respring without a passcode. This could be extremely useful for a number of reasons, like if you forgot your passcode or your friends changed it on you without you knowing. It does, however, bring up some security concerns for Jailbroken devices. Its developer notes though that this only works on Jailbroken devices and is not a bruteforce attack. This is not an attack in any kind, not even a bruteforce attack. What it actually does is disabling the passcode completely without the need of cracking it or accessing the keychain. To make things more whitehat though the developer isn’t going to release the tool in its current state, rather require users to download a Cydia tweak for it to work. In my opinion this kind of eliminates the usefulness of the tool, but it will stop people from using the tool maliciously. The tool is still a work in progress, but we will keep you updated when it is released. Would you be interested in such an application? Let us know in the comments section below.